Repair and rebuild any rigid and semi-flexible plastic including ABS, PVC and CPVC. Rebuild automotive trim, fiberglass parts and vinyl siding. Bonds instantly with superior strength and does not shrink or pull away. Sets in 20 minutes. Drinking water safe. An alternative to welding, soldering, and brazing. Will bond to most clean and dry surfaces and sets in 1-2 hours and will fully cure in 16-24 hours. Waterproof, petroleum, chemical, and acid resistant when fully cured. It can be drilled, tapped, machined, filed, sanded, and painted. Super strong, non-toxic, and temperature resistant up to 600oF. 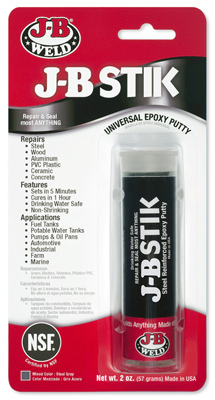 Steel Reinforced Epoxy Putty Stick. 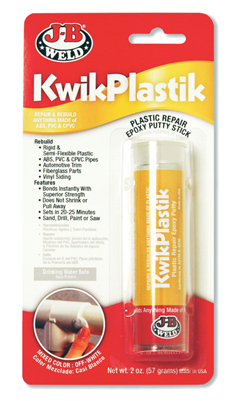 Hand kneadable epoxy adhesive will plug holes and make permanent repairs on wet and dry surfaces. Cures completely submerged in gasoline or under water in 60 minutes. Can be drilled, sanded, filed, tapped, machined and painted. 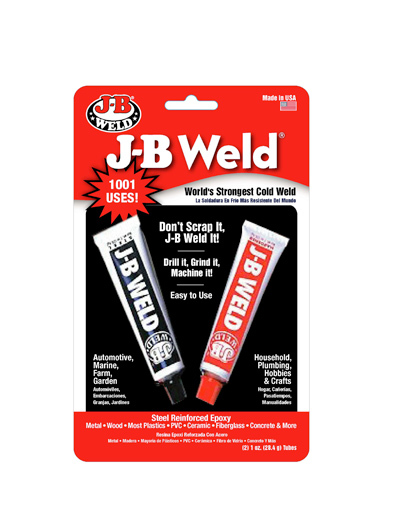 Bonds to virtually any surface including metal, wood and plastic. 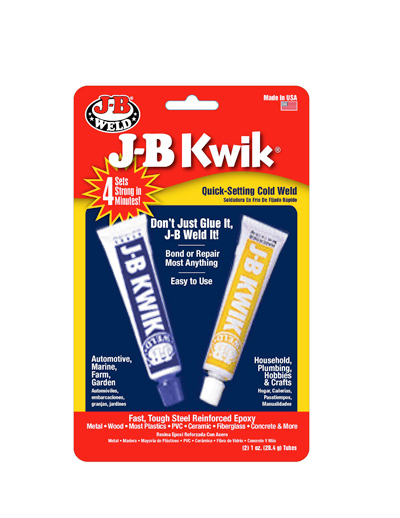 J-B Kwik is a fast set _ cure version of J-B Weld that will set in 4 minutes and fully cure in 4 -6 hours. Waterproof, petroleum, chemical, and acid resistant once fully cured. Non-toxic and is temperature resistant up to 300oF. Can be used on almost any surface _ bronze, porcelain, ceramic, marble, glass, wood, concrete, fiberglass, steel, iron, copper, aluminum, ABS & PVC plastics. Make permanent repairs in moist or under water applications. 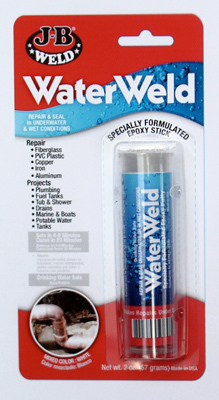 Waterweld will fully cure in 60 minutes and will adhere to most any surface. Once cured Waterweld can be drilled, sanded, filed, tapped, machined and painted. Turns do-it-yourselfers into repair professionals.